Katella Deli is a bit of a landmark in Los Alamitos, CA. I've only eaten there twice, though, and most recently this summer with my family and my junior high English teacher, Mr. White. Mr. White and I are Facebook friends, and I always enjoy his silly grammar posts. English teacher humor. 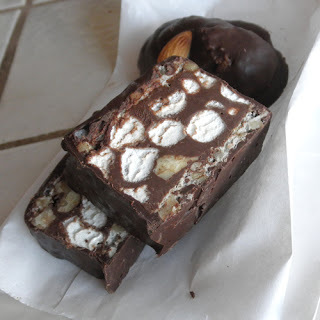 We had a delightful time chatting and catching up; Mr. White gave me a copy of his father's book, Whitey's Career Case: The Insulin Murders; and I was introduced to rocky road. All in all, a great day. I've eaten rocky road ice cream, and I've seen the Rocky Road candy in the shiny red wrapper, but I'd never had this before. 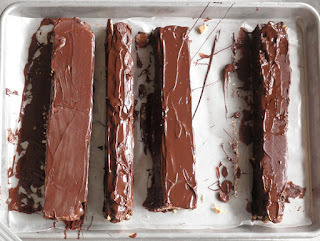 It was chocolatey, creamy, nutty, slightly peanut buttery, and it had delicate wafer-like layers on the top and bottom. I LOVED it. I'm only now getting around to figuring out how to make it. This is my first attempt at recreating what I had at Katella Deli. 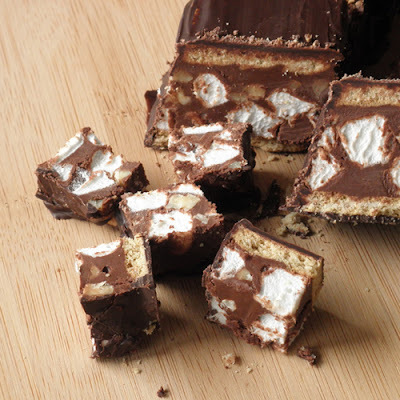 If I make this again, I'm thinking I'll skip the graham crackers and chocolate coating. Katella Deli can do it beautifully, but as you can see from my pics below, it was pretty messy. 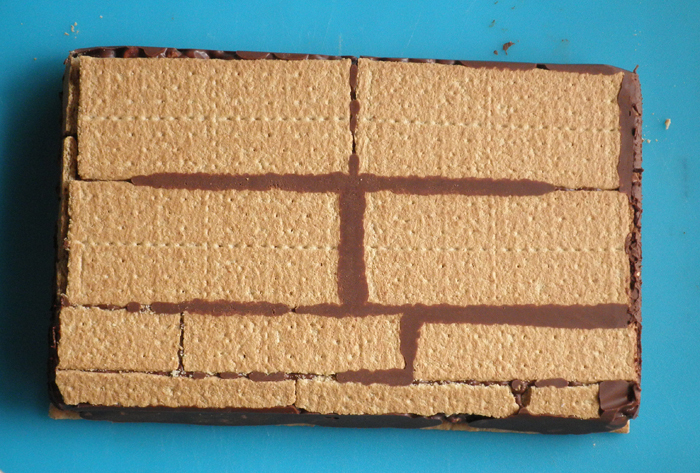 Plus the graham crackers were denser and crunchier than Katella Deli's delicate wafery layer. Maybe it will soften in a day or so, but I think this confection would be just about as delicious if it were placed in a pan and cut like fudge. Grease or line a 7" x 11" pan with parchment paper or wax paper. Place 6 graham crackers over the bottom and cut one cracker with a serrated knife to make pieces that will fit into the blank spots. In a heavy medium saucepan over low heat, melt together 2 cups of chocolate chips, peanut butter, and Nutella. Stir until smooth. Remove from heat and stir in marshmallows and nuts. Spread mixture over graham crackers. 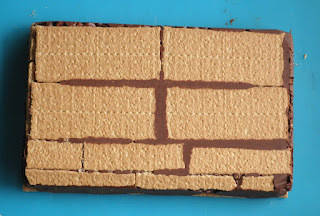 Cover with a layer of graham crackers, again cutting the extra cracker to make smaller pieces to fit into blank spots. Cover with plastic wrap and foil. Allow to cool completely in the refrigerator overnight. In a double boiler, melt 1 1/2 cups of the remaining chocolate chips. Stir until just melted. Remove top of double boiler from the bottom and stir in the remaining 1/2 cup and stir until completely melted. If it seems to take a long time, you can place on the double boiler again for 15-20 seconds to heat a little more. Line a cookie sheet with wax paper. Carefully spread a thin layer of melted chocolate over every side of each strip of rocky road. 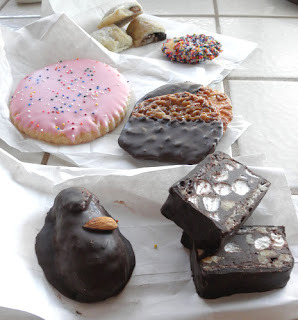 Set on wax paper and place in refrigerator to set. Once chocolate is set, cut 3/4-inch segments with a serrated knife. Store in an airtight container. I think it tastes best at room temperature. I think this would have tasted good to just grab it and bite it. Coating these in chocolate was super messy. 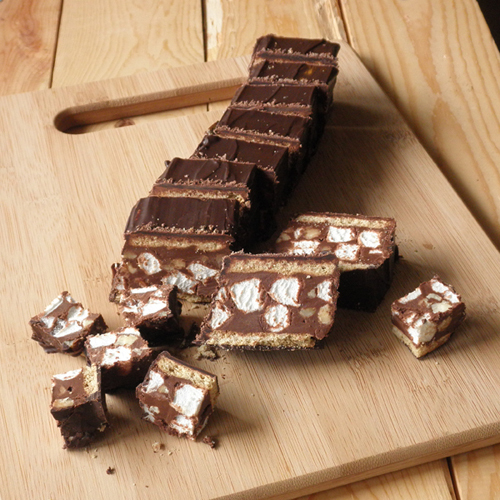 Katella Deli's Rocky Road. So, so good. of all their names. Sorry. I cannot even handle how awesome this is! How on earth did you even make it to the end? I would have started inhaling the ingredients all on their own.